These are all the Blogs posted in May, 2011. We departed from Fishers Island at 0900 and continued on what would be the last day of our journey from Florida to Rhode Island... it was another gloomy day and we did not see the sun all day… we had current running with us all day which helps make a gloomy day a little better… the only down side of the day was that the wind picked up a little from the SE and made the ride a little bumpy but nothing that was unpleasant. BUT IT WAS COLD!!! Low 50’s when we left and it did not get much warmer all day… what was surprising to me was the number of people out on the water… we must of seen 50 plus boats during the trip… they all appeared to be fishing… sitting bundled up holding their rod and reels… way too cold for fishing in my opinion. The day was uneventful and we arrived to Warwick at 1500 and docked at Brewer Greenwich Bay Marina located in the NW corner of Greenwich Bay… N41°41.087', W071°26.816'. We will be here about two weeks as we prep the boat for our summer on Block Island. Today we traveled for 6 hours covering 47 nautical miles averaging 7.8 knots. This was the last day of our trip from Florida to Rhode Island… we traveled 27 days covering 1433.66 nautical miles (1650 miles) for an average of 53.1 nautical miles (61 miles) per day. Departed from City Island at 0640 hours and headed east on Long Island Sound. Very gray and gloomy morning... but the sound was flat calm like a sheet of glass... very nice compared to what we had to travel in the last few days. It was actually kind of eerie as you could not distinguish the horizon. We would traveling the entire day on Long Island Sound and planned to stop where ever we happen to be at between 1800 and 1900... we had the current in our favor most of the day giving us a boost in speed running around 8 knots... that was until we were just south of The Race when rather abruptly our speed changed from 7.8 knots to 5 knots in a matter of a few seconds and with this loss in speed our destination was now determined... we would stop at Fisher Island. Winds were southerly so it would provide good protection... we anchored on the North West end of Fishers Island in West Harbor just outside the channel leading into the inner harbor and town... we joined a lone sailboat that had just anchored before we arrived. 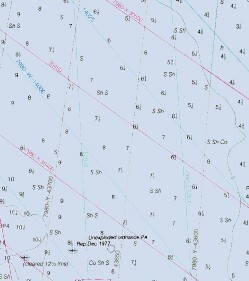 At 1910 hours we were securely anchored in 20 feet of water at N41°16.256', W072°00.025'. We had traveled for 12 hours and 30 minutes and covered 86 nautical miles averaging 6.9 knots. After our day yesterday of being beat up by the seas offshore and a horrible inlet… we opted to not set any alarms and sleep in. Of course we were both wide awake early…so much for sleeping in. We did not rush to leave though… the forecast was for the winds to lay down to 5-10 knots from the north and switch to SE 5-10 by late afternoon… of course there would still be the ocean swells… looking at the sea buoy reports the waves were 3-4 feet with an 11 second period… with little to no wind this would be a comfortable ride so we decided to give it a shot… at 0900 we weighed anchor and headed for the inlet… we had seen a lot of the fishing boats and several small craft head out ahead of us but we still felt a little uneasy about the inlet. As we approached the inlet from inside we could see the ocean swells breaking across the channel pretty much the same as they were when we entered yesterday… however, they were not as big and we were also going to be at a totally different attitude… they would be hitting us on our port bow and we had the current running with us pushing us out at close to 10 knots. We got to the breaking swells and they were big and a few things were thrown around as be came up and over each swell’s peak… even at close to 10 knots we had to go over several of these breaking swells before we were back into deep water and it calmed down… well not really calm… we still had the large swells coming out of the NE and they were as big or bigger than the day before… from the our pilot house which your eye level is about 15 feet above the surface… as we were in the trough between swells you could look out and see the top of the next swell at eye level… BIG BIG SWELLS but luckily they were not continuous like this… only one like this every 4th or 5th swell… the ones in between were much smaller… but these rogue swells were really big… we did not have any wind ro speak of… less than 10 knots and it was having no effect on the seas. We were also getting a good boost of speed from current making 7.5 knots plus…. GPS has at 5.5 hours to Sandy Hook. Things did not change much as we continued north other than we were picking up speed… miles away from New York you still get the effect of the tidal current of the harbor and looking ahead we would carry this flood current all the way through Hell Gates in the East River to Long Island Sound. As we entered the Ambrose ship channel taking us into New York from the Atlantic we were cruising at 10 knots… it’s great when you get a boost like this. New York Harbor is a very busy place from commercial traffic… as we entered we were passed by several large ships both exiting and entering the harbor… it’s amazing how these large ship scan move so fast… passing us as if were were standing still. No matter how many times we go through New York it’s an amazing experience. We did carry our boost of speed all the way through the East River and into Long Island Sound… arriving at our planned destination for the day at 1915 hours… City Island, NY… N40°50.648’, W073°46.806’. Today we traveled for 10 hours and 15 minutes covering 79 nautical miles averaging 7.7 knots.